London South Bank University (LSBU) holds annual graduations in the autumn of each year at the Royal Festival Hall which is part of the Southbank Centre, London. 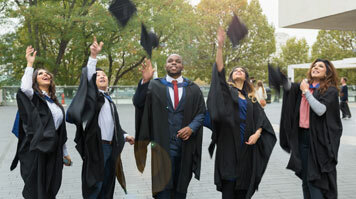 LSBU holds three School ceremonies on Monday 14th October 2019. Each ceremony is invite only. All eligible graduates will receive an email invitation to their event in mid August 2019. Once a graduate has booked their place they will receive a confirmation email which provides information about guest tickets, robe hire, photography, DVD suppliers and graduation merchandise information. Find out more about graduation.